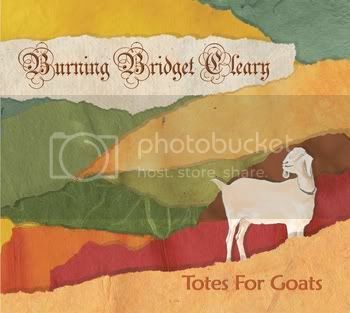 To conclude my St Patrick’s Day festival, here is the new album from Burning Bridget Cleary, Totes for Goats. Somewhere, there is a rulebook for putting together an album of traditional Irish music. It says that there should be sets of dances, jigs, reels, strathspeys, hornpipes, and the like, and these lively instrumentals should alternate with songs featuring vocals. Then more instrumentals, chiefly a slow air or two, can be worked in. This is a good set of rules, and Burning Bridget Cleary followed them in putting together their new album. So here are five songs and five dance sets, plus two slow airs and one other instrumental. But otherwise, Burning Bridget Cleary breaks as many rules as they follow, and the resulting album is a delight. Genevieve Gillespie and Rose Baldino each sing and play fiddle and banjo; I’m not sure which one I’m hearing where, because the album notes do not say. But both women have beautiful clear voices, one alto and one soprano, and they trade off lead and harmony vocals, depending on the song. The interplay of their voices is just one of the many pleasures here. Both women play the fiddle with a beautiful clear tone; that’s what I said about their voices, and indeed, their fiddle playing has an amazing vocal clarity to it that one rarely hears outside of classical music. This quality is one of the highlights of the band’s sound. Lou Baldino plays electric and acoustic guitar and electric bass, and overdubbing is used so that he can play more than one on the same song. Lou Baldino provides a solid rhythmic foundation, but he also takes a couple of solo turns here that show off his fine work as a lead player. When last I heard the group, they were a trio, but now the have added Peter Trezzi on djembe and drums; he plays on perhaps half of the album’s songs, so I wonder if he may have joined the band after they started work on the album. Then again, not every song here needs percussion, so it could be as simple as that. These are not selfish musicians; some songs have only one fiddle, or just guitar. Cleary does not need to add instruments to make sure everyone has something to do; rather, they excel at giving each song just what it needs. Guest musicians on a few tracks add bodhran, stand-up bass, and pennywhistle. The treatment of the five songs here is unusual. Three of them are traditional songs, while The King and the Fair Maid is a cover of a song by the German Celtic band Cara, and The Connemara Shore is a traditional poem with original music by Lou Baldino. As recorded, The King and the Fair Maid sounds the most traditional, while the three traditional songs get varying degrees of folk-rock treatment. In the lyrics, The King and the Fair Maid has a “Did she really just sing that?” moment; yes she did, but it’s not quite that simple. I don’t want to spoil the surprise, but this is a moment of good humor that only makes the band more appealing. The acoustic instruments always dominate the arrangements, but they are used in ways that can border on Steeleye Span territory. It is a sound that Cleary makes work for them. The Connemara Shore is the ringer here. This is the first time I have heard Lou Baldino sing. He uses the high end of his tenor range, almost in falsetto territory, and it limits his expressiveness. It also gives this song a 70s pop vibe that doesn’t fit the sound of the rest of the album. That said, the song does have its own beauty. I would like to hear Baldino sing lower in his range next time, however; I think that would fit the overall sound of the band better. Let me also say that Lou Baldino has written two other songs on Totes for Goats, and they are both stunning instrumentals. One is a brief solo guitar piece, (just 39 seconds!) called To My Wife, Short and Sweet. Based on this song, she is lucky to have found him. How do you say “I love you” without words? You play the notes you need, and then you stop. The last of Lou Baldino’s tunes is called Jimmy’s Groove; this one is placed in the dance set called The Unfortunate Rake along side two traditional tunes, and it sounds right at home. I confess that I can not tell the difference between a jig and a reel, but whatever this one is, it is a fine example. I mentioned that there are five dance sets. Each one has great energy, and the transitions within each set are executed perfectly. In Irish dance music, these sets are constructed in such a way that one tune stops and the next picks right up, with no break in the music. The dancers keep going as if nothing happened, but the knowledge that it did makes the dancing that much more enjoyable. There is no transitional music to get from one tune to the next. Cleary executes these transitions perfectly, making each one an exciting moment. There are, as I mentioned, five dance sets here, and each has a different flavor. The first, Where’s Pete? leads off the album, and features twin fiddles dancing over Lou Baldino’s strong rhythm lines and great propulsion from the bodhran part. Sloppy Set starts with a heartbeat on the bodhran, but the treat here is the interplay of the two fiddles. There is also some banjo on this one, but strictly as a rhythm instrument. The Unfortunate Rake is two guitar parts overdubbed, with no other instruments. This is Lou Baldino’s shining moment, and he delivers a wonderful set. Jigs for the Gangly Sort is a fiddle and guitar duet; the guitar plays a rolling rhythm with single-note runs on top, and the result is a wonderful musical conversation. Finally, there is The Fort. This one is for guitar, fiddle, and electric bass, and it has a mostly acoustic sound but a rock feel. This is one of my longer reviews, but I must take a moment to talk about the two slow numbers. I don’t know if they qualify as slow airs, but they are two of the most emotionally powerful moments on the album. On Lament for Emil, twin fiddles keen over a drone that I think is played on an electric guitar. There was an ancient Celtic custom of sending the bodies of dead nobles out to sea in funeral barges; I get a mental image of that as I listen to this song. This is clearly a song about honoring the departed and seeking comfort in shared mourning, and I have never heard it done better. The album closes with The Cuckoo. It starts with fiddles played in a rougher, more folky style than elsewhere on the album, accompanied by a bowed bass. Half way through, the bass player switches to plucking and the fiddle sound smoothes out and gets back to that vocal quality we’ve been hearing. This style shift does not break the mood at all. This one has a wonderful aura of peaceful contemplation, and it is a great way to end a beautiful program of energetic dances and beautifully performed love songs. 1. Lou's singing is also on their first two CDs. Have you not heard those? 2. Pete Trezzi has been with the band since at least mid-2009. 3. Genna is the soprano, Rose is the alto. 4. Yes, they really did sing that. I did a double-take too.